Dr Kashif Saleem is a finance specialist with a keen research interest in asset pricing, energy economics, risk management, econometric modelling, asset management, valuation, corporate governance, derivatives, and emerging financial markets. 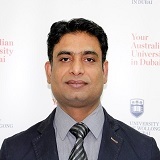 Currently teaching on UOWD’s advanced managerial finance, quantitative economic analysis and corporate finance subjects; Dr Saleem brings with him significant international academic experience having previously been employed by LUT School of Business, Lappeenrata University of Technology, Finland as an Associate Professor in Finance and by St Petersburg State University’s Graduate School of Management as a Visiting Professor. “Overinvestment, growth opportunities and firm performance: Evidence from Singapore stock market”. Corporate Ownership and Control, Volume 12, Issue 3, Pages 454-467, 2015. Dr Saleem is a member of the Multinational Finance Society, the Graduate School of Finance, Finland, the Eurasia Business and Economics Society, the American Finance Association, the European Finance Association and the European Financial Management Association. He is also an Editorial Board Member of the Eurasian Journal of Business and Management.